When grades are due, a Grades Due alert will appear on the homepage. The alert box contains the name of the marking period, the due date for grades, and the current teacher's course(s). A date in the Submitted column indicates that grades have already been submitted for that course. Click the Go link for a course to get started. Choose the source of the grades a teacher wishes to submit. Pick from a Gradebook or the last published progress report. If the Full Gradebook option is selected, then the summary grade will include unpublished grades as well. 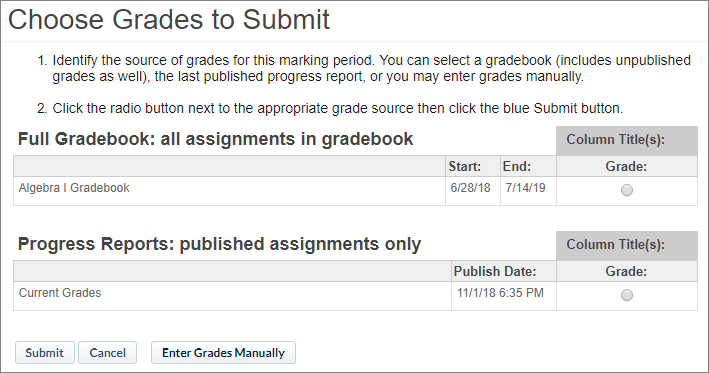 If the Progress Reports option is selected, then the summary grade will only reflect published grades included in the last published progress report. Personalize choices for grades, work habits, etc. using the drop-down menus for each column. Click the Submit Grades button. Repeat this process for each course as needed. Note: When resubmitting grades, do not uncheck any students that need to receive a grade, even if grades have already been submitted for them. Unchecked students will not receive a grade.